The 18-carat gold pendant is in the shape of Lil Wayne's face. It features two diamonds for the Lollipop singer's famous teardrop tattoos, which represent the deaths of people in his family. Lil Wayne's latest album Tha Carter V, which features collaborations with Snoop Dogg, Nicki Minaj, Travis Scott and Kendrick Lamar, reached number five in the UK charts this month. Image caption Artist Joy BC said Lil Wayne's friend told her: "He absolutely loves it"
Ms Bonfield-Colombara, who goes by the name Joy BC, said she was "freaking out" when she was told who the commission - which she said was for "thousands" of pounds - was for. "I was about to say 'no, I'm really sort of trying to figure out stuff with school'. They then said it's for my friend's birthday and told me who the friend was," she said. "I listened to hip hop from a young age. I used to listen to him in the club!" She said she had two to three weeks to complete the order in time for Lil Wayne's 36th birthday. "I phoned my boyfriend and said I'm freaking out, I'm freaking out," she said. "I hand carve everything, it takes me a really long time. One piece I made for someone took nine months. "My boyfriend was like you can't do a Ronaldo on him," she said, referring to a bronze bust of footballer Cristiano Ronaldo that was mocked on social media. "He said 'it's got to look like him, you can't make an awful portrait'." 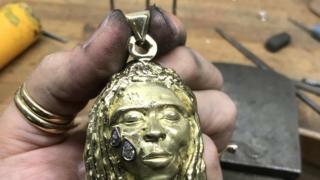 ‘An Icon’: Bespoke Hand carved Portrait of Lil Wayne in solid 18ct yellow gold with white gold set diamond tears. Joy BC 2018. One of a kind piece commissioned to mark Wayne’s birthday and release of Tha Carter V. Such an honour to make this piece for the one and only @liltunechi What’s more, is that this commissioned piece meant I could stay in school. Forever greatful. ‘Can’t control the tears: let them drop and roll. DONT CRY FOR ME: (those are tears of joy)’ 👁 👁 #precioustears #dontcry it’s the 💎 #carterV #lilwayne #tearsofjoy 💎#uproar #gold #diamond #tears #tearsofjoy #bespoke #portrait . Photo by @pictureriley . .
Ms Bonfield-Colombara, who previously studied at Glasgow School of Art, said she had been applying for help with her course fees. "My mum took out a bank loan and I got a government loan for living expenses which I had to use on my fees. "I was thinking I can't afford this. The whole time I was questioning whether I should do it. But I'm really enjoying the course. "I needed to find close to £10,000. I did a GoFundMe page and managed to raise £1,500 through that. Then I got this email. I couldn't believe it." Although the commission - which she said cost "thousands" - does not cover all of her fees, she said it pays for a "chunk". Jonathan Boyd, a senior tutor on the RCA's jewellery and metalwork course who teaches Ms Bonfield-Colombara, said she was a "very determined artist" and the commission was a "great opportunity".